I’ve heard he’s charming, modest and generous. GSOH. That’s some write up. Torsten Lauschmann’s practice is extraordinarily expansive too; he makes work in a broad range of contexts—galleries, theatre and the internet, and across as many media—video projection, animation, photography, music and sculpture. And there is a sense of experimentation and of addition and subtraction which exists across all of it. In an attempt to define this multi-faceted order, academic Neil Mulholland recently described Lauschmann’s work as being a ‘variety show repertoire’. Each Lauschmann piece is moulded to contexts relating to media and venue: he knows how to play it, if you like. His gallery exhibitions are played straight with discreet objects and sculptural video. Whilst the trans-European, solar-powered electro-busking-tour undertaken by his alter ego, Slender Whiteman, is definitely played street. You could view any facet of Lauschmann’s practice in isolation from the rest and it would still operate: his work is characteristically self-sufficient—he rarely relies upon reference or theorising to give or advance meaning. His use of found footage or found drawings, for example, is about use of the image, rather than about originality or authorship. Since around 2004 Lauschmann has been developing a digital collaging technique, whereby footage is edited by applying masks, allowing him to manipulate sections of video into shapes, which are layered to form a larger, fragmented digital image. The resulting footage is then projected on to wall-drawings, the contours of which fit exactly these sections of moving image. In the first of these digital projections, ‘The dust has come to stay’, 2004, unconnected sections of found footage are projected on to a simple line drawing of a mother, father and child, and are accompanied by an equally fragmented soundtrack. The cacophony of languages, genres and musical soundtracks, from circus-ring to melodrama, and the way that faces and bodies fit awkwardly to the drawn outlines, creates a sense of deep disturbance and tension. 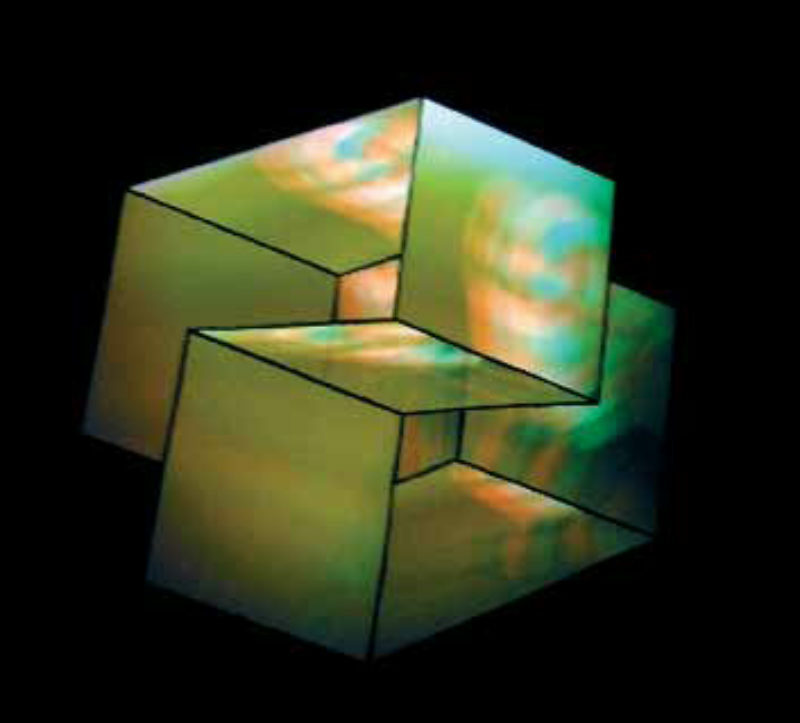 ‘Suburbia in 3D: Chasing Butterflies’, 2004, and ‘Rope Dancing’, 2006, use the same technique, projecting onto complex geometric shapes resulting in an extraordinary illusion of three-dimensionality. But unlike ‘The dust…’ these works appear as silent ‘objects’ floating in space. Lauschmann’s titling betrays a sense of romance, or at least an allusion to emotional life, which potentially sits at odds with a practice typified by an exploration of the aesthetic potentials of technologies and digital practices. 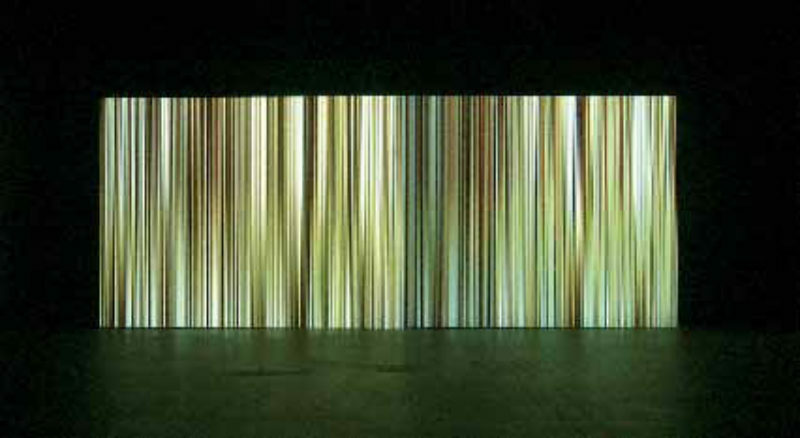 Another video projection, ‘The Curtain’, 2006/ongoing, pulls together these two sides of his practice. Through playing around with mathematician John Conway’s ‘Game of Life’ (a computer game or ‘cellular automaton’ in which a number of cells live, die or multiply according to a set of mathematical rules, thereby forming various visual patterns), Lauschmann created an abstract visual effect of vertical bars, fluctuating in opacity. When projected floor to ceiling, the pattern, created within the rules of the ‘Game’, has the appearance of a shifting stage curtain. The emotive impact of this, probably Lauschmann’s most simply constructed work, is remarkable, the viewer endlessly awaiting the start of a performance that never begins. It is in the work where he employs more traditional media (relatively speaking) and his subject matter almost follows suit, where the disjuncture is most explicit and where his practice really appears to bisect. In ‘Mother and Child’, 2004, a video of Lauschmann’s partner, the artist Cathy Wilkes, sleeping in bed with the couple’s baby nestled in the crook of her arm, is projected onto a gold-painted wall. The work has a quality of almost photographic stillness; the only movement is the slight rise and fall of their breathing. Lauschmann also continues to develop a series of 9 × 12cm format Polaroids, started in 2004, representing mainly domestic interiors; an ibook playing a Disney animation; tiny greasy hand prints on a window pane; light falling through an open doorway. Double-exposures and the imperfections inherent to the medium emphasise the nature of these photographs as small and unique fragments of a family life. In part, this is where Lauschmann’s generosity of spirit becomes apparent. Presenting such intimate moments from your own life for public display risks self-indulgence, but he somehow achieves affecting and deeply personal work without a leaking sentimentality. In talking about ‘The Mathematician’, 2006, Lauschmann reveals his own awareness of this?strange tension between logic and emotional life. An animated portrait of the mathematician Pál Erdös, made up of numbers and mathematical signs, is projected on to an old-fashioned easel blackboard. The mathematician, in old age, speaks of his childhood, of his mother and domestic life and of how, as an adult, his home was ‘not really defined’, his having never settled down, instead living and working as an itinerant genius, arriving on the doorsteps of a long list of colleagues, working and discussing theorems for a couple of months before decamping and moving on. Lauschmann seems fascinated by the way in which such phenomenal mental capacity can be accompanied by a disabling social ineptness. Mathematics and geometry run as a thread throughout Lauschmann’s work. 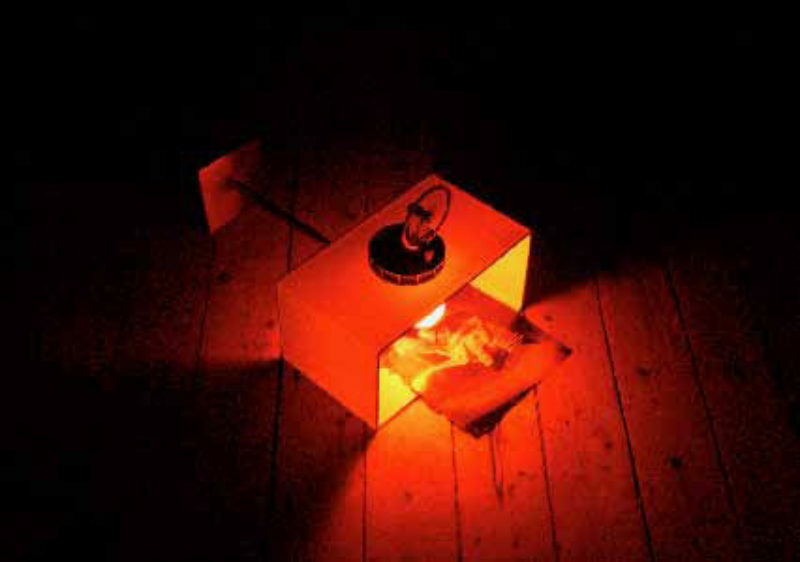 In ‘Interference, Even’, 2006, shown alongside ‘The Mathematician’ in an exhibition at Mary Mary gallery in 2006, a young woman contorts her body into a crab posture, her toes touching the floor, her hips raised up sharp and her body supported on her elbows while she writes on a piece of white paper, endlessly captured by the loop of the film. As her action goes on and on, a geometric shape spins in the right hand corner of the film, somehow mirroring her complex posture and her endless action, but collaged and incongruous nonetheless. The geometric shape acts as a kind of wrench from the cinematic seduction of the scene; reinstating the two-dimensional and in some way breaking the illusion of the film. Shown alongside these two projections in the Mary Mary exhibition were two sculptural works. In ‘Untitled’, 2006, the mythic peacock, associated with an imperious pride, eats chips off greasy brown paper. Above this broken metaphor hangs another, a chandelier constructed from a complex web of many coloured connectors – an overly elaborate arrangement which serves only to illuminate a tiny bulb at its centre, titled ‘Self Portrait as a Pataphysical Object’, 2006. 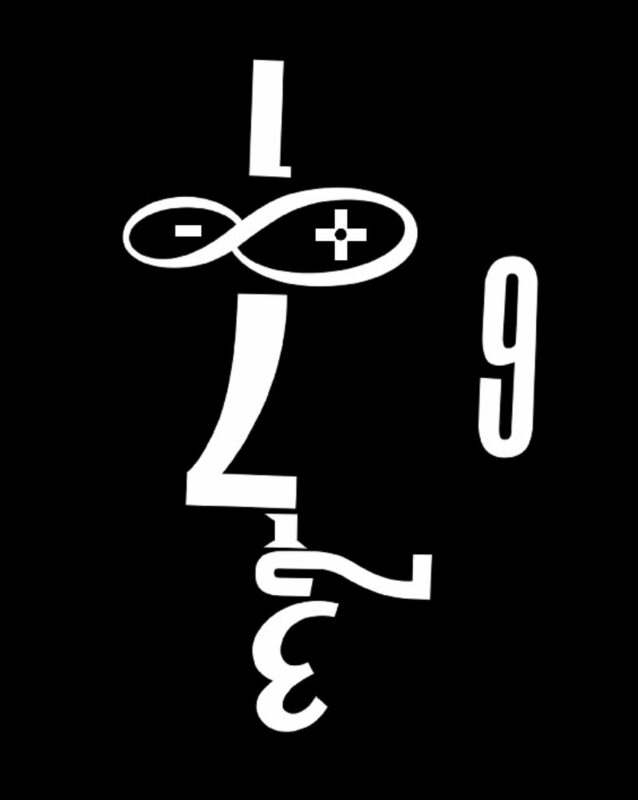 Pataphysics, a term coined by Alfred Jarry, is the ‘science of imaginary solutions’. This ‘Self Portrait’ is a distillation of the very particular brand of humour by which a lot of Lauschmann’s work operates: the Tommy Cooper school of comedy, the triumphant failure. The minimal output makes ridiculous the time and labour involved to construct the object; the invention is half-baked. In his sculptural work, Lauschmann almost lines up objects as props for a gag. 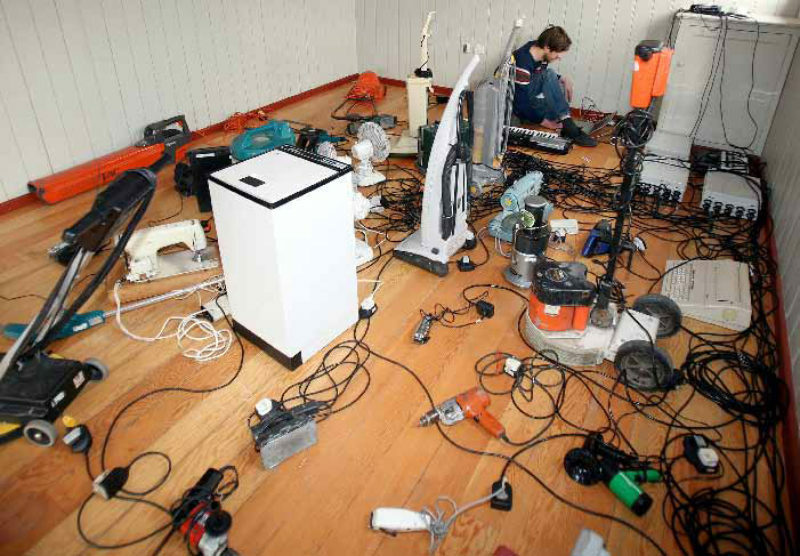 In a recent work, ‘Piecework Orchestra’, 2006, 40 electrical appliances, amongst them vacuum cleaners, power tools and sewing machines, sprawl out across the floor. The machines are programmed to buzz, whir, snap, flash, crash and shift to an arranged composition. The resulting score is impressive, but has something of the slapstick about it. In spirit, it follows on from an earlier work, ‘Wunst’, 2004, where objects again took on a performative, comic role, and music fulfilled the function of rousing emotion and bringing people together. Lauschmann invited the audience of his private view at Glasgow’s Transmission to take up instruments. But they had to choose instruments they didn’t know how to play. Lauschmann liked the idea of a public failure, but this was by no means a misanthropic exercise – the failure was common and generously shared amongst all present. ‘Wunst’ inaugurated the space as a gathering place and laboratory for an interested community, setting the experimental tone for his exhibition there. The inherent failure which is quietly present in much of his practice is writ large in a work Lauschmann made for the web and which became one of the biggest viral jams of 2006. Under the pseudonym of Professor Hans Peter Niesward of the Institute for Gravitational Physics in Münich, he stage-managed ‘World Jump Day’, an event which was surely conceived with failure in mind—as if it could happen and as if it would work. Niesward’s hypothesis was that if everyone in the western hemisphere jumped at the same time, the world would shift out of its orbit and into another in which it would not be subject to the effects of global warming. Lauschmann once again revealed his ability to adapt to the context of display, exploiting to the full the phenomenal viral capacity of the internet and a global audience’s desire to find a common purpose. In the end, it is the most obvious thing that holds Lauschmann’s work together, and it’s the thing that makes sense of the rave reviews he has collected recently. It’s a very particular, and charming, personality.